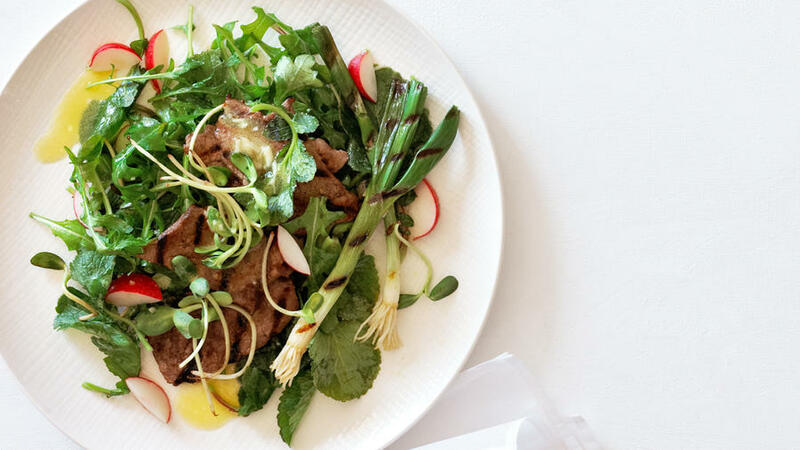 In the earliest years of my career as a chef and cookbook author, having thoroughly internalized the principles of Richard Olney’s classic book Simple French Food, I cooked spring vegetables briefly and dressed them sparingly, and adding only what was necessary. But over time, my perspective has shifted. Now, I appreciate complexity and the way one or two ingredients can change a dish, elevating it from flat to transcendent. In these five recipes, I hope to show you what I mean. None of the salads are difficult, but they’re full of tips and tricks that can be applied across seasons and to other dishes. 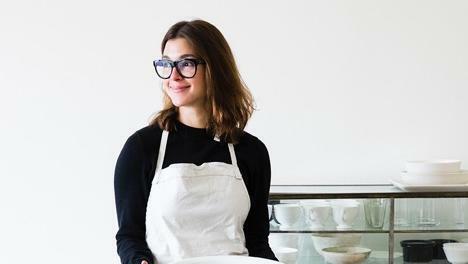 My ultimate goal is to free you of recipes, to empower you instead with techniques and flavor combinations, so that you can show up at your farmer’s market one crisp morning armed only with an open mind. 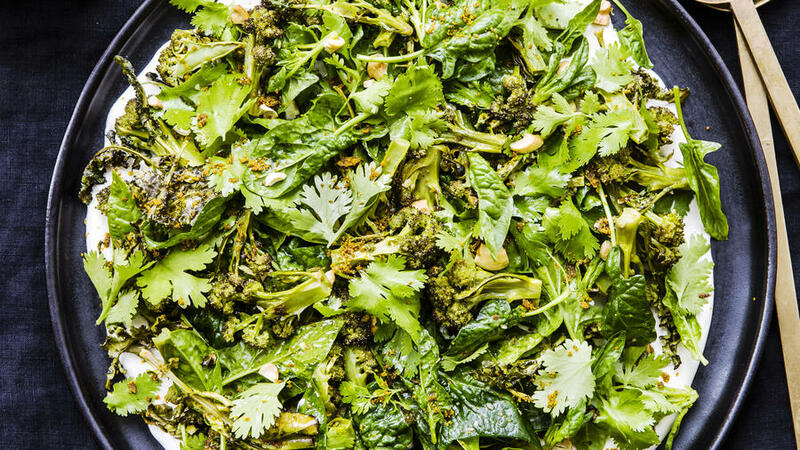 This salad benefits from a variety of greens: at least one sweet (pea shoots and flowers, fava greens), one peppery (watercress or peppercress), and one bitter (dandelion greens or amaranth). For the herbs, use a mix of mint, dill, parsley, or chervil; fennel fronds work too. The crisp edges and chewy stalks of roasted broccoli are especially addictive when dragged through a thick, lemony cashew “cream” and dusted with fiery vadouvan, a French-Indian spice mix. 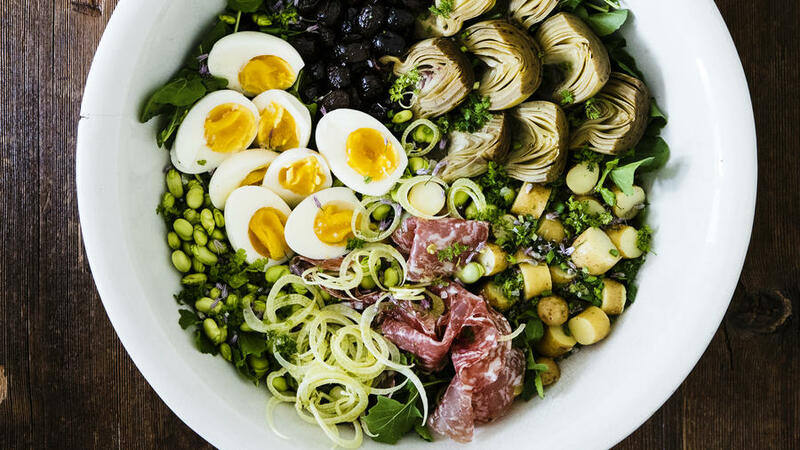 If Niçoise and antipasti had a love child, this would be their girl—simultaneously elegant and rustic. Crisp lettuces like Little Gem (a miniature romaine) are often served with creamy dressings. 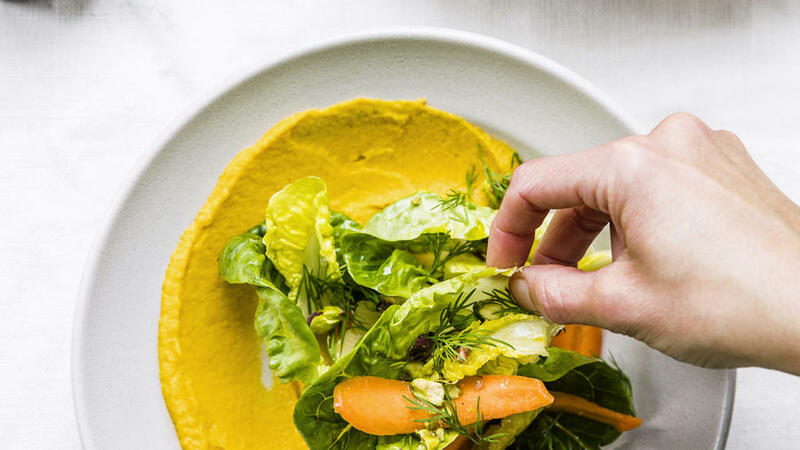 Here, the dressing has been deconstructed; the vinegar and oil lightly coat the leaves and vegetables, while borani, a creamy Iranian-style yogurt dip, creates a bed. Use the lettuces to scoop up the dip if you like. “When I first sketched out this idea, I never imagined what a happy surprise it would be,” says Michelle McKenzie. “I couldn’t predict how perfectly nutty black rice would complement asparagus, or how spicy mizuna would play so nicely with sweet mint. Or that green onion could add just enough punch. I guessed, but didn’t fully believe, that a tahini and fish sauce dressing would pull everything together.” But all of that happens here. 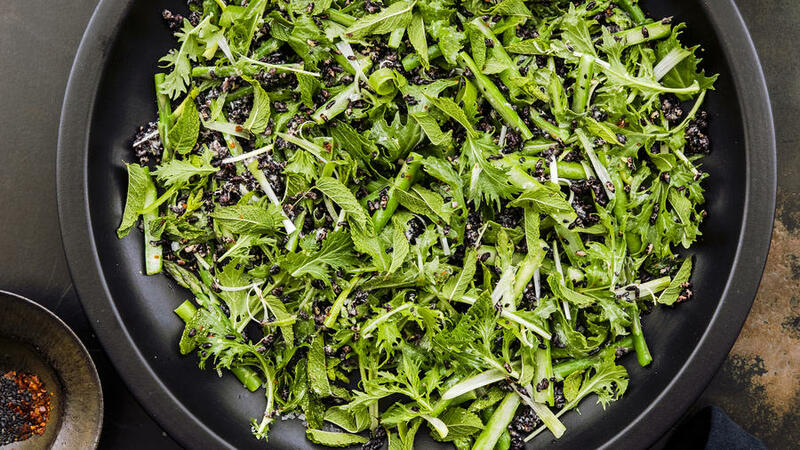 Choose the littlest, tenderest dandelion greens for this unusual twist on chicken salad. 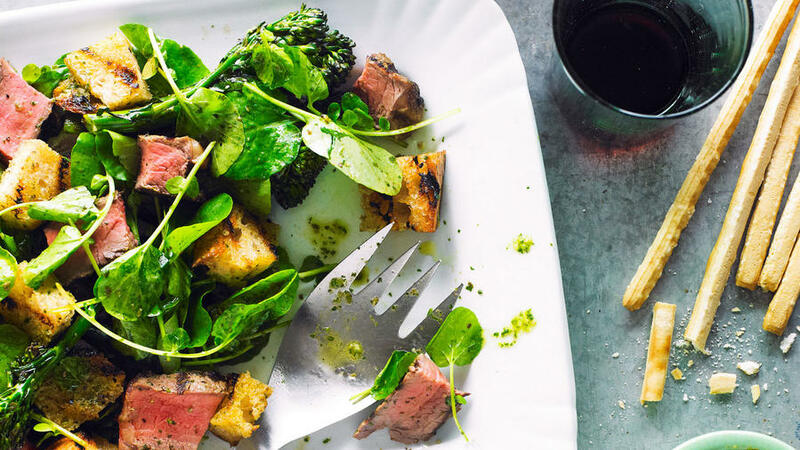 Although broccolini is available year-round, its tender sweetness conveys spring. Don’t confuse it with broccoli rabe, which looks similar but has a bitter edge. The briny, herbaceous Italian-style salsa verde works beautifully as both a marinade and a table sauce. 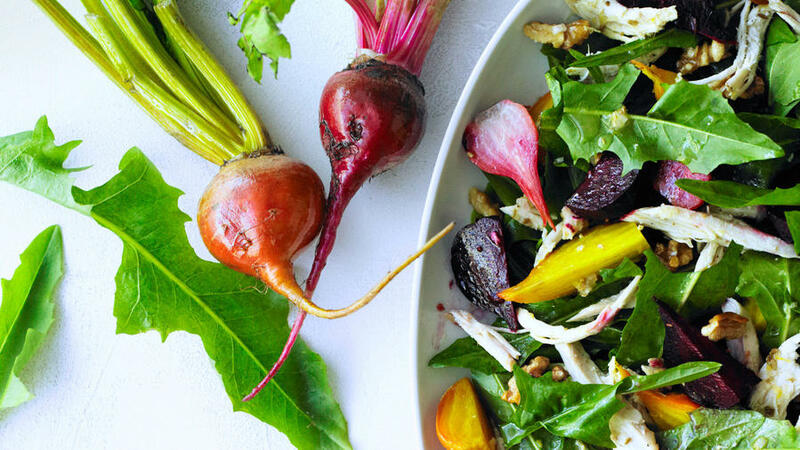 Young radish greens, sunflower sprouts, and spicy arugula give this salad plenty of character. Spring onions look similar to green onions (a.k.a. scallions), but have larger bulbs, with a sweeter, more mellow flavor. They hold up very well to grilling. 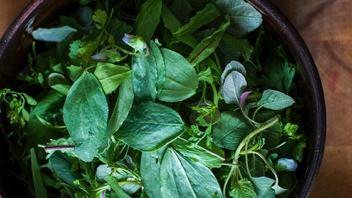 The fresh, light Vietnamese way with herbs makes so many dishes from that country especially appealing in spring. 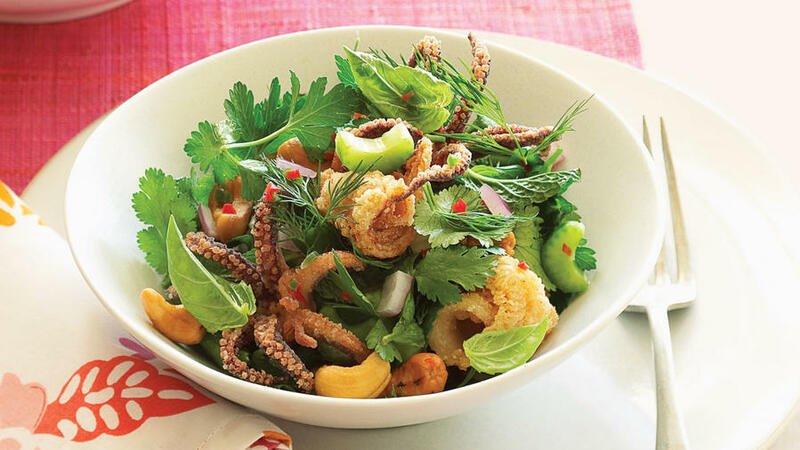 With its abundant mint, basil, dill, parsley, and cilantro to offset the rich, crunchy calamari, this Vietnamese-inspired salad pays homage. Get perky specimens from sources you trust. Seek out unsprayed, freshly harvested food, easiest to find at a farmers’ market but also available at some grocery stores. If you do this, your meal is likely to be both safe and delicious. What grows together goes together. If you happen to spot a shiny early zucchini or tomato months ahead of its peak season, don’t pair it with your already-bought April asparagus. Keep walking. Use what you’ve bought within three days. Due to their high water content and thin skins, spring vegetables are particularly prone to spoiling. (See my storage and prep tips below.) For that reason, they also need close attention if you are cooking them: In a hot pan, the vegetables can go from perfect to injured in a matter of minutes, sometimes seconds as in the case of peas. Consider surprising substitutions. Salt, acid, and fat are necessary in salad, but the options go beyond the typical ones of salt, lemon, and olive oil. For instance, fish sauce can be used instead of salt, pickled radish for acid, and coconut oil for fat. Harvest your modern larder for these elements of intrigue. Think about counterpoints in flavor. Since a lot of spring produce is relatively sweet, it has a natural affinity for many fun, funky, bitter, and bright ingredients, like preserved lemon, fruity-hot chiles, and tahini. Work in textural contrasts, namely crunchy versus creamy. Assess the texture of a vegetable and the way it will be affected by how you’ll cut or cook it. A crisp carrot shaved into ribbons will provide a more delicate snap than if sliced crosswise into coins, for example. Then go back to your larder. Crunch can come from toasted nuts and grains, fried capers, and bacon. Creamy ingredients include yogurt, crème fraîche, fresh cheeses, soft-cooked eggs, and bean and vegetable purées. Lastly, think more about layering and less about mixing. If you dump everything into a bowl with vinaigrette and toss well, the ingredients may get damaged and the flavors muddled—so I like to dress some components, but not others. The trick is to make sure each one tastes perfect before it’s added to the salad. That makes every bite unique. STORE. Chill vegetables, leafy greens, and herbs in an airtight container lined with paper towels. Whenever the paper is wet, replace (usually every other day or so). Chill asparagus and edible flowers upright, cut ends submerged in water (as if in a vase), uncovered, for up to 3 days. WASH. Excessive water causes speedy spoilage and can damage delicate leaves, so try to avoid washing delicate herbs and flowers, and wash everything else the day you plan to make a salad. For greens, trim and pluck off any wilted or tough outer leaves. Fill a large bowl filled with cold water (I often add an ice cube). Add the greens to the bowl, but not so many that they’re crowded. Swish with your hands and let debris sink to the bottom. Lift greens into a colander or spinner and dump water; repeat until no sand remains. DRY. 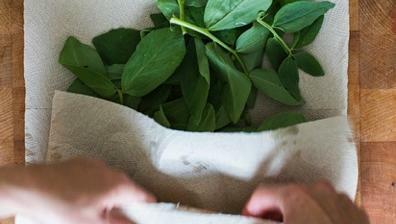 Use a salad spinner or spread wet greens on a kitchen towel, top with paper towels, and loosely roll. Chill up to 12 hours.